SAN FRANCISCO, June 13, 2018 – Intersolar and ees North America, the premier solar and energy storage events, will award California Gov. Edmund G. Brown Jr. with the first-ever Intersolar Champion of Change Lifetime Achievement AWARD. Each year, Intersolar recognizes an individuals’ commitment to supporting the development of renewable energy with the Champion of Change AWARD, hosted in partnership with the California Solar and Storage Association (CALSSA). The Lifetime Achievement AWARD honors pioneers in clean technology and their outstanding accomplishments in advancing the adoption of renewable energy. For nearly five decades, Gov. Brown has dedicated his efforts toward building an emission-free future by enforcing sustainable policies within the state of California while also contributing to national and international green initiatives. Under his leadership, California has solidified its position as a global leader in solar and clean energy, being home to one third of the country’s solar workforce and the largest solar market within the U.S. Gov. Brown appeared at Intersolar North America as a keynote speaker in San Francisco, and promoted the economic and environmental benefits role solar and renewable energy technologies offer. Gov. 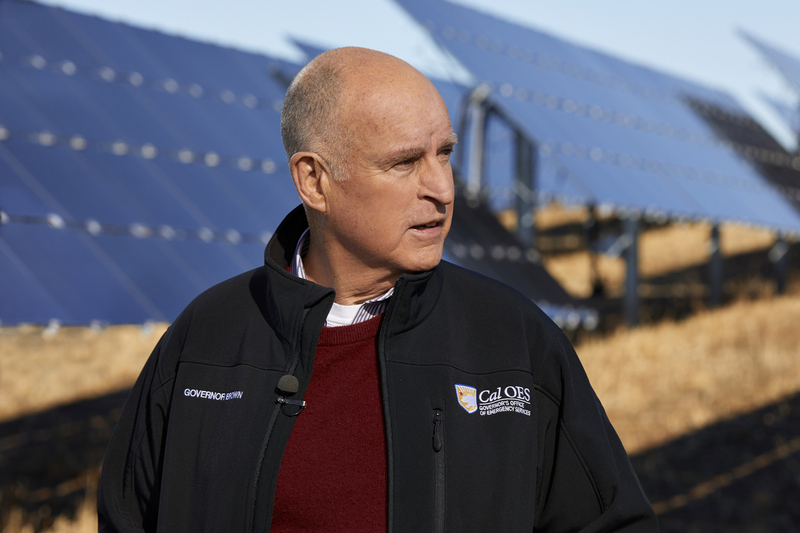 Brown’s commitment to solar dates back to the mid-1970s and early-1980s during his first term in office as the Governor of California, where he halted the expansion of nuclear power and promoted renewable energy. Now about to end his fourth term, Gov. Brown has been a policy trailblazer for the solar industry. In 2015, Gov. Brown signed a mandate for 50 percent renewables by 2030 inspiring many states like New York and New Jersey to follow suit. More recently, the governor formed the U.S. Climate Alliance with state governors across the country, in response to President Trump’s decision to withdraw from the Paris Climate Agreement, to further battle the effects of climate change and drive the United States’ sustainability efforts. Expanding to the international level, Gov. Brown co-founded the Under2Coalition, a global commitment to combating climate change and represents more than 1.3 billion people in GDP, 17 percent of the global population. And this year, under the governor’s leadership, California adopted the nation’s first policy requiring all new residential construction in the state to have solar installed starting in 2020. By honoring individuals such as Gov. Brown, Intersolar and ees North America, as well as its partners, shine a light on those helping drive new energy technologies forward, and underscores the events’ commitment to supporting the solar economy in California and beyond. For more than a decade, event organizers have worked closely with organizations such as CALSSA, NAATBatt and NorCal Solar to help advocate for programs and policies important to the solar and storage industries and have also offered financial support. Off-site networking events, such as CALSSA’s annual Summerfest, serve as important fundraisers for the organizations. All proceeds from Summerfest go directly toward CALSSA. In 2017, CALSSA raised nearly $500,000 from all activities at Intersolar North America. Registration to Intersolar and ees North America’s exhibition and conference is available online. Members of the press can now apply for a media pass here. Tickets for Summerfest, as well as other networking activities including a San Francisco Bay Sailing Tour, trip to solar installations in Wine Country, and a tour of notable solar projects in San Francisco are available for purchase. All attendees are able to attend the Opening Ceremony and Champion of Change AWARD Ceremony on Tuesday, July 10 at 8:30 a.m., which will feature keynote speakers Tony Seba, author and Silicon Valley entrepreneur, and Elaine Ulrich, Ph.D. Senior Advisor U.S. Department of Energy. Information on all AWARDs can be found here. Since 2008, Intersolar North America has served as the industry’s go-to source for invaluable information and premier networking opportunities that move the North American market forward. Co-located with ees North America, Intersolar North America’s exhibition and conference sit at the cross-section of solar technology, energy storage, and smart renewable energy. The event takes place annually in San Francisco, California, the heart of energy innovation, and is co-located with SEMICON West. More than 530 exhibitors and 15,000 visitors from over 80 countries participated in Intersolar North America 2017. The conference and exhibition program featured 39 sessions with more than 220 speakers and 22 educational workshops. Intersolar Global is the world’s leading exhibition series dedicated to the future of clean energy. With more than 25 years of experience, Intersolar has the unique ability to bring together members of the energy industry from across the world’s most influential markets and supply chains. Intersolar exhibitions and conferences are held annually in Munich, San Francisco, Mumbai and Bangalore, São Paulo, and Dubai. These global events are complemented by the Intersolar Summits, which take place in emerging and growing markets worldwide. For more information on Intersolar Global, please visit: http://www.intersolarglobal.com. Covering the entire value chain of innovative battery and energy storage technologies, ees North America is the leading exhibition and conference for the electrical energy storage industry. ees North America connects manufacturers, distributers, users and suppliers of stationary and mobile storage products in the epicenter of the U.S. storage market, California. Co-located with Intersolar North America, North America's premier solar event, ees North America provides the best opportunity to explore energy storage systems in combination with solar technologies and beyond. The events are co-located with SEMICON West at the Moscone Center in San Francisco. In 2017, 130 energy storage exhibitors and 15,000 attendees participated in ees North America and Intersolar North America. Launched in 2015 as a special exhibition, ees North America became a standalone exhibition and conference in 2016, and is now part of the ees global exhibition series. Together with ees Europe in Munich, ees South America in São Paulo, and ees India in Mumbai, ees events are represented on four continents.